Lubicom Marketing – Page 2 – Strategy. Creativity. Success. For nearly 1,000 years, powdered green tea, or matcha, has been used in Japanese Zen tea ceremonies. The tea-making ritual is said to transport the participants to a meditative state of mind. Boiled down to its basics, the tea ceremony consists of whisking hot water and powdered green tea; its aim is to increase alertness and presence of mind. In the last few years, matcha has taken a wild turn from the spiritual to the stylish: a highly-Instagrammable trend, the brilliant green of matcha lends itself to photography as well as health trends. You betcha your matcha it is! Made from the leaves of the Camellia sinensis shrub (the same plant that gives us black, oolong, white, and green teas), matcha is a specially grown and processed form of green tea. In contrast to regular green tea, in which the leaves are brewed or steeped, with matcha, the tea leaves are ground up to a fine talc-like powder and ingested whole. Because matcha contains the entire tea leaf, the nutrients are more concentrated. Also, the leaves are shaded during growth, which causes the plant to produce high levels of theanine, catechins, chlorophyll, and caffeine. Theanine: This amino acid is found in tea leaves and some mushrooms. Research has shown that theanine promotes relaxation and eases stress. Theanine comes in pill form to treat anxiety and high blood pressure. Catechins: A class of flavonols which may act as antioxidants in the body. Catechins are believed to prevent cell damage, help with weight loss, and fight diseases like heart disease, hypertension, cancer, and Alzheimer’s. Chlorophyll: A natural detoxifier, chlorophyll can regenerate cells, fight infection, and help with wound healing. Caffeine: Matcha has more caffeine than green tea, but less than coffee. 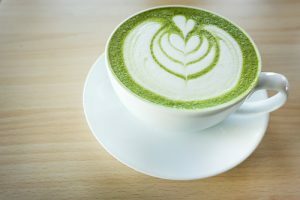 Matcha has been gaining traction as a coffee alternative; many matcha drinkers find that they get the same caffeine high from matcha as they do from coffee, without the accompanying jitters or afternoon crashes. (If you’re curious, “Booo Yaaa Tea” apparently contains 1 teaspoon of matcha with honey, lemon, and vanilla bean paste. In the Japanese tea ceremonies of old, matcha powder was enjoyed simply — just stirred with hot water. But now, there are about as many ways to devour matcha as there are Instagram accounts that use matcha in their flauntable grass green creations. Matcha Custard, Oreo Matcha Cheesecake, Matcha Froyo, Matcha Macarons, even Matcha Chocolate Swirl Cookie Pops; matcha powder can be used in applications ranging from baked goods to smoothies and soups. Ceremonial grade: The ultimate grade of matcha, used in Japanese tea ceremonies. Ceremonial grade matcha is made from the youngest tea leaves, with the stems and veins removed. By far the most expensive of the types, ceremonial grade matcha can be recognized by its superfine texture and brilliant green color. It is the least bitter grade of matcha, and is used exclusively for traditional tea. Premium grade: For unschooled drinkers of matcha, premium grade is hard to distinguish from ceremonial grade matcha. It is good for daily consumption in matcha teas, or any other use that requires a high-quality matcha flavor. Cooking/culinary grade: The cheapest matcha, culinary grade is expressly for recipe use, like in matcha smoothies and baked goods. On its own, culinary grade matcha is bitter and not as smooth as its higher quality counterparts. Because of its super-concentrated form, matcha can cause an upset stomach in users who are not used to it. Experts recommend starting with a small dose (¼ teaspoon) when first ingesting matcha. Because of the caffeine content, the recommended amount of matcha intake for pregnant women and children is unclear, and seeking medical advice is recommended. Also, one study found that a Chinese-grown matcha contained high levels of lead. For safety and quality, look for matcha that is grown in Japan. In one word, comfort food is nourishment. Comfort food is what tastes delicious to us — physically, emotionally, and viscerally. If comfort food was a location, it would be home. It would be, more specifically, our childhood home. In a kitchen, probably, with fragrant steam rising over bubbling pots, sharing a meal with our loved ones, and our most meaningful memories. Comfort food is not simply a burst of fat or sugar, or the happy marriage of both (buttercream frosting, I’m talking to you!) The specific foods we choose to eat to lift ourselves out of bad moods, or to engage in happy ones, are wired deep inside the mysterious pathways of our brains. Comfort foods are the foods we have learned to associate with our childhoods; we subconsciously link comfort foods with safety, security, and the warm fuzzies of being cared for. Is it a melty, bright orange mac and cheese? A pint of ice cream crammed with chocolate peanut butter cups? A beef burger with delicious fat dripping onto its white-bread bun? Far from universal, comfort food is in the eye — ahem, on the tastebuds — of the beholder. According to a 2003 University of Illinois study, males and females report drastically differing comfort foods. Studies show that women go cuckoo for cocoa, while men are mad for meat. For comfort, males turn to warm, hearty meal foods (like steak, casseroles, and soup). Women, on the other hand, prefer cold, sweet snack foods (like chocolate and ice cream). But we’re betting you already knew that. Now That’s Some Scrumptious Psychology! Remember Pavlov’s salivating dogs? The experimenter’s canines started to drool when they heard the bells they were conditioned to associate with mealtime. Turns out we have lots in common with Pavlov’s pooches — at least when it comes to comfort food. And it’s not only the cooking of our parents and grandparents that shape our comfort food preferences — our individual cultures play a huge role as well. So, if you wash down a wedge of handmade shmura matzah with grape juice, the part of your brain marked “Pesach” will fire up with neural activity. Oh, and don’t be surprised if you’re suddenly overcome by an intense horseradish craving. 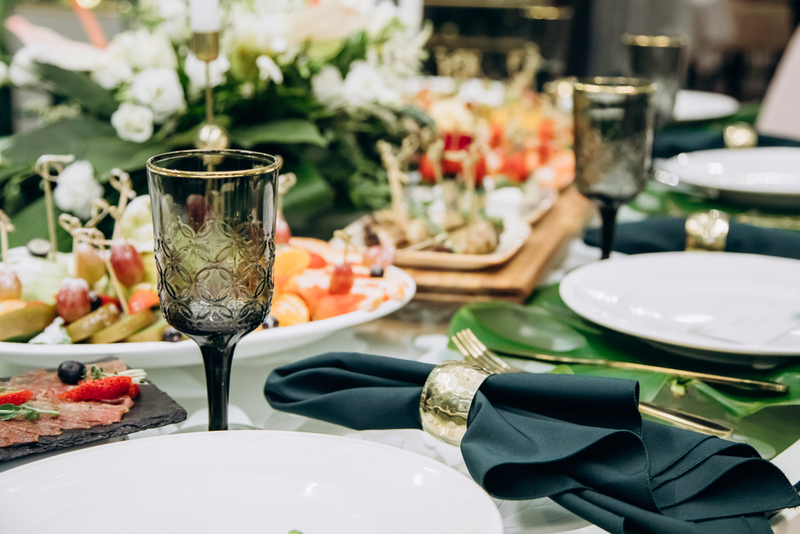 Food has the astonishing capacity to walk us through the vagaries of life — food is there when we learn, grow, build relationships, worship, and celebrate our most precious occasions. “Occasionally eating comfort foods can be a part of a healthy relationship with food, if you do it while staying in touch with your satiety levels and without guilt,” write Tribole and Resch. 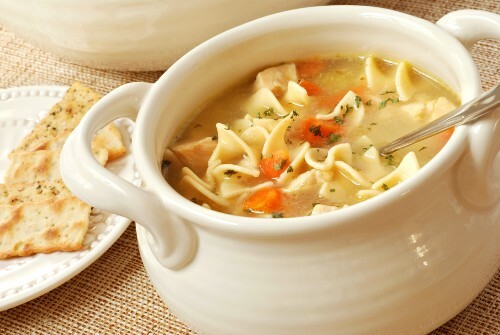 But when comfort food becomes the #1 relied-upon coping mechanism, it can be painfully damaging. When it is not your primary coping mechanism, food can be a great (and healthy) comfort. Take Geneen Roth’s advice in the book When You Eat at the Refrigerator, Pull Up a Chair: Eat a Hot Meal Every Day. Carve out the time to cook and enjoy some nourishing (and hot!) 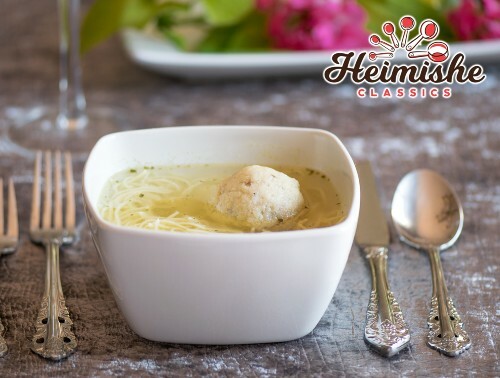 traditional Jewish comfort food. To many, Middle Eastern food is something that’s wrapped up at a falafel truck and eaten on the go. However, the cuisine of the Fertile Crescent is far-reaching, spanning entire countries and generations in its evolution. Two of the most enticing and versatile ingredients in this cuisine are rich tahini and bright, fragrant turmeric- ingredients which open an entire world of culinary possibilities. 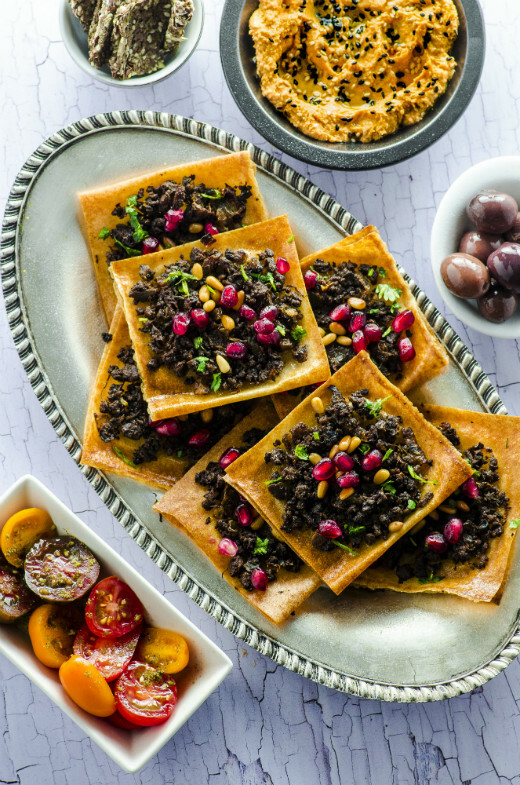 In a cookbook named in their honor, recipe developers and sisters Ruth Fox and Vicky Cohen modernize Middle Eastern cuisine with dishes that celebrate their plant-based sensibility, many of them created with an eye toward every-day ease. I sat down with the superstar sisters to discuss the book, their upbringing, ingredients that intrigue them, and, of course, some of their favorite food obsessions. Mussy: Was there anything you wanted to do before you started cooking? Vicky: I have always been an entrepreneur; I owned several businesses before starting “May I Have That Recipe” with Ruth. Ruth: I always wanted to be a doctor. As I got older, I became more interested in food and nutrition, so I got my degree in Nutrition and Dietetics. Mussy: What’s your favorite breakfast? Vicky: My favorite breakfast is overnight oats. I love how I can spend five minutes at night and have a ready-to-eat breakfast the next morning. During the cold months, I like to eat overnight oats warm. In our cookbook, we have a delicious overnight oats recipe with pomegranates, persimmons, pistachios and a touch of cardamom. Ruth: My favorite breakfast since we developed the recipes for our cookbook is the Tahini Smoothie Bowl, because I just love tahini. I like to use different fruits depending on what’s in season. Mussy: What made you decide to write a cookbook? Vicky and Ruth: We have both been working together on our blog “May I Have That Recipe” for six years. The idea of a cookbook was always in the back of our minds. After several of our readers asked us if we were going to come out with a cookbook, we decided to go for it. We wrote a proposal, looked for an agent and she found us several publishers who were interested. Mussy: What does the name Tahini and Turmeric mean to you? Vicky and Ruth: Tahini and turmeric are evocative of the Middle East and of our family background. It means warm, fragrant, aromatic food, and family gatherings around a holiday table. Mussy: Is there one food that you’re secretly obsessed with having at home at all times? Vicky and Ruth: We are both obsessed with tahini, we just love it. It is such a versatile ingredient that can be used for sweet and savory dishes. Mussy: Do you have a favorite childhood comfort food? Ruth: Za’atar Manaish (basically a za’atar pizza). Our mom used to make the dough from scratch and I always looked forward to it. 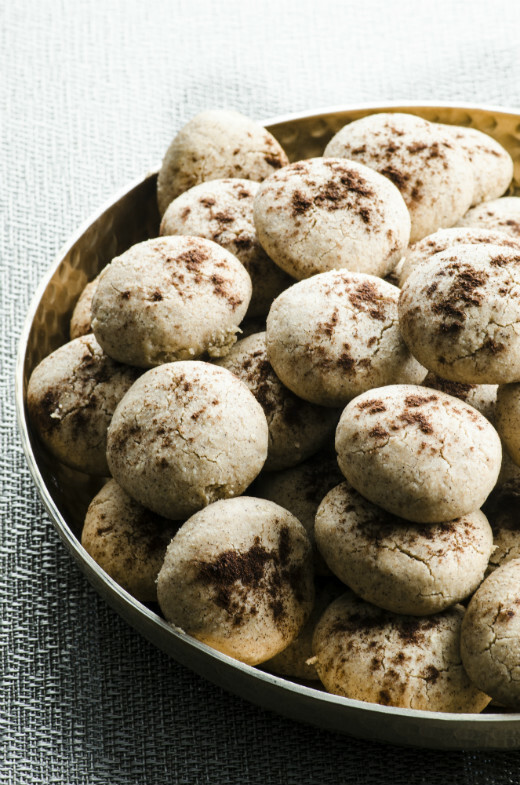 We have a recipe for Za’atar Manaish in our cookbook. Mussy: The first thing I noticed about your cookbook was how gourmet the recipes were. Tell me a little about your cooking background. Vicky and Ruth: We are both home cooks. We learned to cook from our mother and grandmother, and learned to develop recipes and photograph them since we started our cooking blog six years ago. Mussy: As I flip through the pages I notice a lot of healthy recipes. 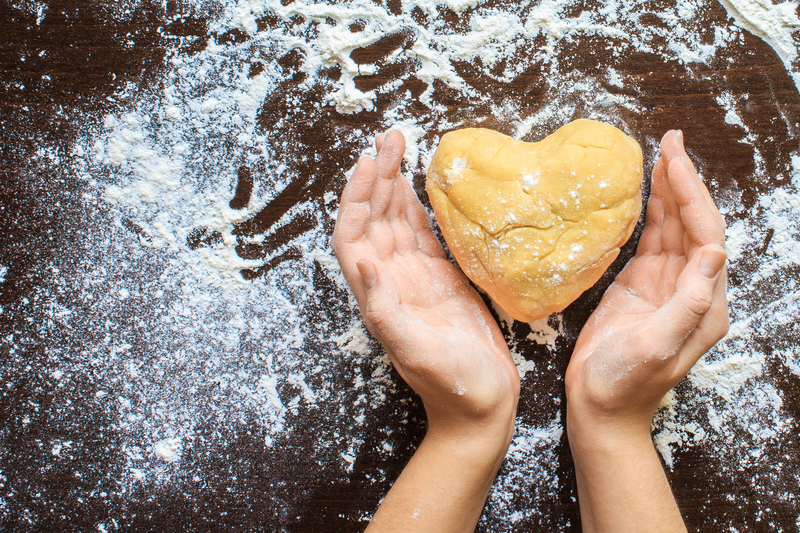 Tell us a little about why you cook the way you do. 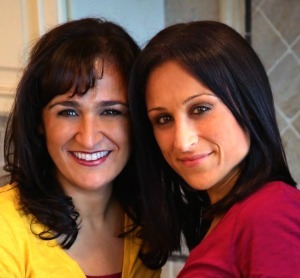 Vicky and Ruth: We are so glad you noticed, we’ve been told often that our recipes are not only tasty, but healthy as well. We like to use a lot of vegetables, fruits, nuts, grains and beans. But what brings it all together are the herbs and spices we use to flavor our dishes. Mussy: What’s a favorite recipe you’ve created? It is really hard to pick, because we put so much time, effort and love into all our recipes! Vicky: Saffron-Infused Cauliflower Soup with Sumac Oil. It sounds fancy, but is really easy to make and has a ton of flavor. Ruth: Creamy Tahini Cheesecake with Pistachio Crust and Fresh Pomegranates. Mussy: What do you hope your cookbook will accomplish? Vicky and Ruth: We’re hoping people realize that plant-based food doesn’t have to be boring, and it can easily be made flavorful and exciting. Also, our cookbook isn’t just for vegans or vegetarians. It’s a great tool for anyone who wants to add more fruits, vegetables and grains to their diet. Mussy: Do you have any tips on how to cook on a budget? Vicky and Ruth: When it comes to produce, buy what’s in season! Also, stock up your pantry staples when they go on sale. Mussy: Do you have any tips for the busy person who wants to eat well at home but doesn’t have a lot of time? Vicky and Ruth: Do your shopping and food prep over the weekend (or whenever your day off is). A little bit of planning will save you a lot of time! Vicky and Ruth: Play with your food! Try new things, experiment. Give recipes your own twist by adding your favorite ingredients. 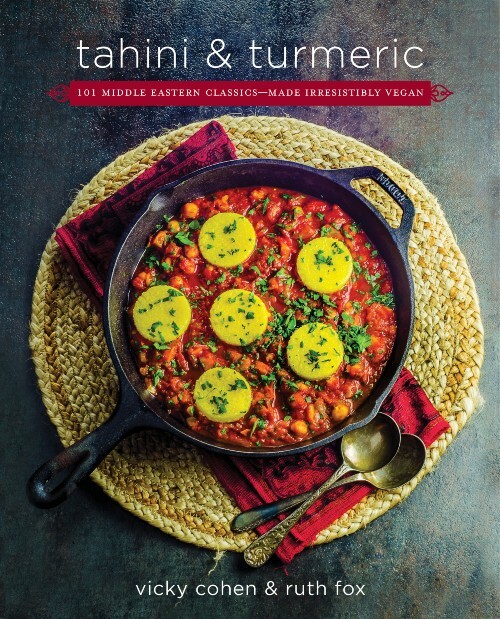 Check out the stunning and delicious Tahini & Turmeric: 101 Middle Eastern Classics-Made Irresistibly Vegan on Amazon. The holiday season is here and there’s absolutely no turning back. If you’re anything like us, the most important part of a morning routine is getting that steaming hot, double-shot, frothy coffee down pat. Our secret to daily coffee perfection? Nespresso machine. 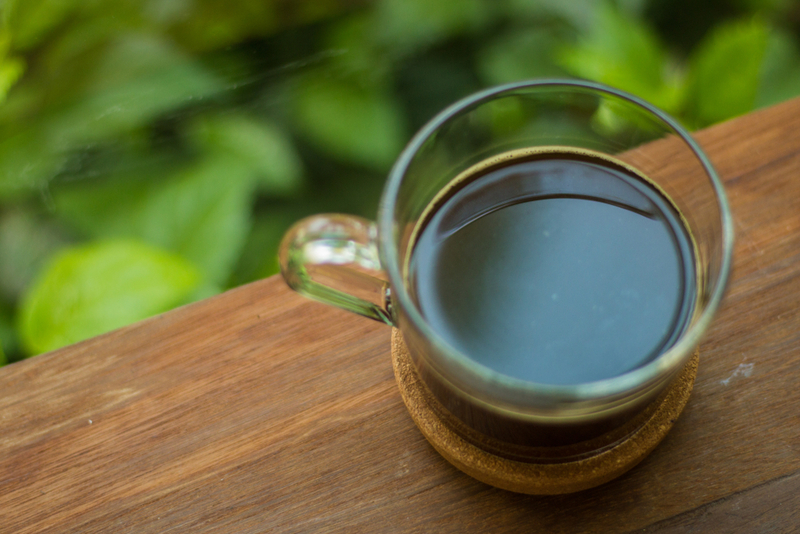 For every coffee addict, there is nothing better than an efficient coffee machine. 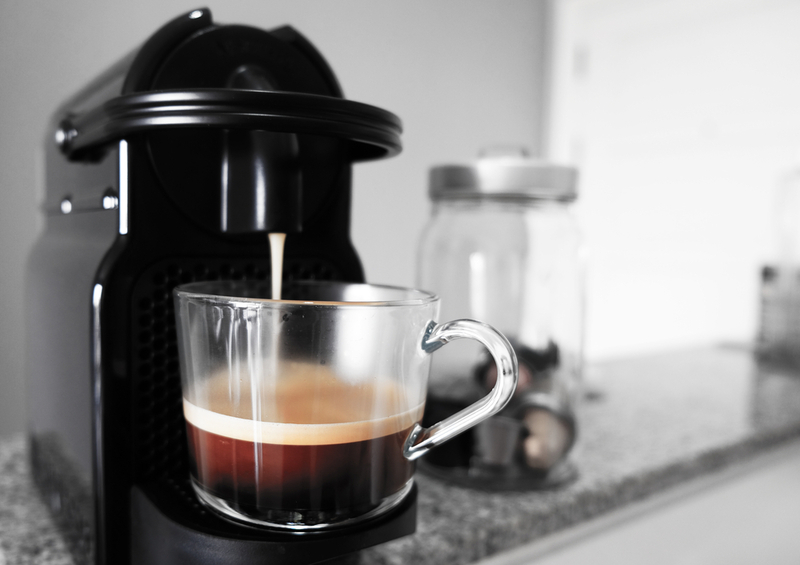 Not only does a Nespresso machine make the best tasting coffee ever, but it’s also fast. (And by fast we mean it takes half the time it takes you to apply your eyeliner in the morning.) Once this sleek machine is sitting on your kitchen counter, you’re bound to look like you have your life in order. Gift yourself, or gift your friends, we don’t care, as long as you make The. Best. Purchase. Of. Your. Life. If you been keeping up with the latest trends you would know that plastic straws are so 2017. At first, we were like you, totally hesitant about this whole reusable idea. 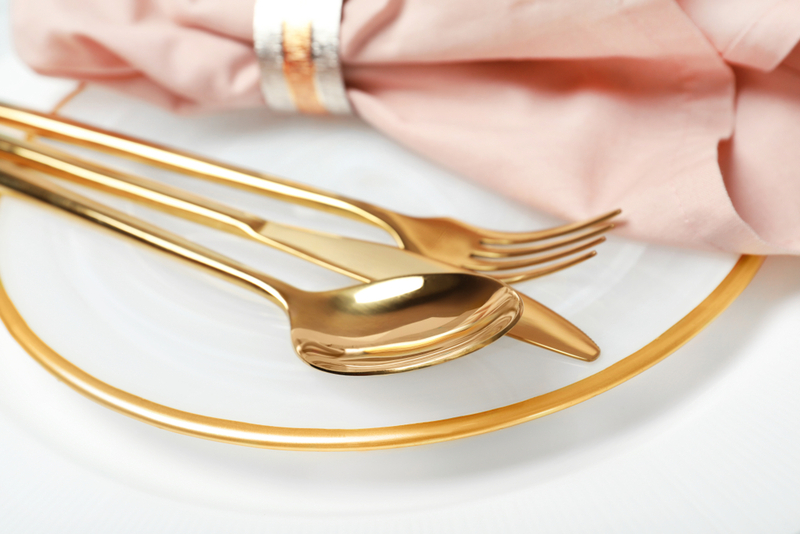 Until we came across the cutest and chic-est rose gold stainless steel straws ever. Extra? Yes. But we love being extra, especially around this time of the year. Whether your giftee loves sipping cocktails on the couch (no shame!) or just gallons of La Croix (really no shame!!) this is the perfect gift for them. So, no, using mason jars just won’t cut it at this year’s holiday parties. Rose Gold straws are where it’s at. 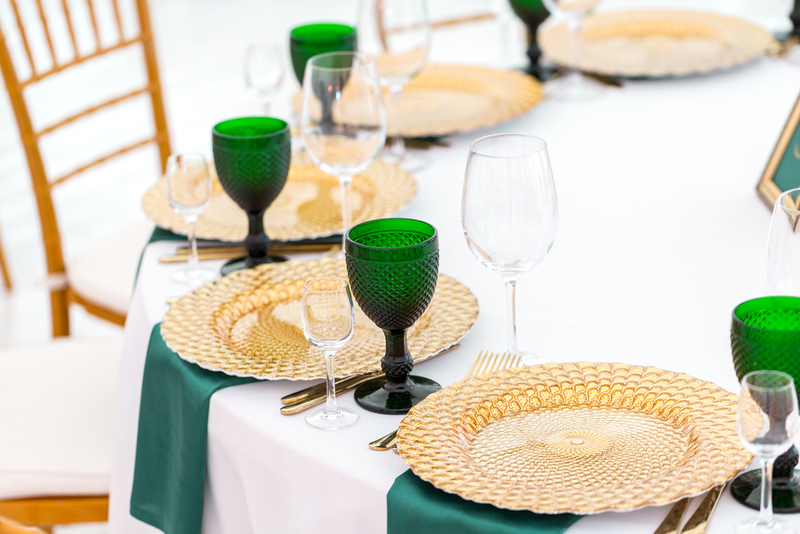 When it comes to party décor, every detail counts and so does every dollar. Let’s be real, guest lists only get longer and expenses higher at this time of the year. 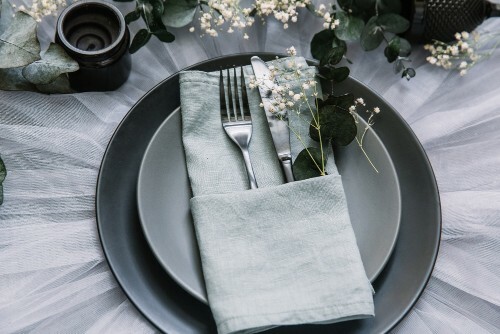 Investing in high-quality linen napkins just might be the answer that you’re looking for. A onetime expense, cloth napkins give that clean and sophisticated look everyone’s aiming to get when they try and purchase the classiest print napkins that somehow end up looking cheesy anyways. Who wouldn’t like receiving a full set of monogrammed linen napkins? This one is for the relative or friend that hasn’t stopped trying to cut soda out from their diet. Not only will this solve their problem, but will also save you from having to listen to them complain daily. With a touch of a button, the soda machine makes the bubbliest, thirst quenching soda water ever. Game changer for when it comes to craving a drink that not only quenches your thirst but gives that fizzy feeling without the two cups of unnecessary sugar. Let’s be real, they’re more than just adding a protective layer under your morning coffee or afternoon beer. Coasters are that funky individualized drink accessory that takes “drinks with friends” to a new level. It’s the type of gift that is just infinitely useful at literally any time of the day. Lucky for you, there are endless options when it comes to picking colors, materials, and shapes. You’re gonna have a blast just placing the order. You’ll probably even end up buying a set for yourself. Don’t blame us, we warned you. They love marble anything, and you know it. A timeless trend, you just can’t let your cheese and crackers be #basic no more. The best part about using boards in the kitchen; there are absolutely no rules. Display homemade goodies, cheese or even boring green veggies on a marble board and you’re guaranteed everyone will go wild. DIY food boards just got an upgrade. Does the Instant Pot Live Up to Its Hype? Posted on December 10, 2018 December 10, 2018 Categories ArticlesLeave a comment on Does the Instant Pot Live Up to Its Hype? Do you know where your family’s supper is? I knew where it was. Problem was, it wasn’t ready. Dinner was bubbling under the glass lid of my crockpot, which I kept lifting up every 17 and 1/2 minutes, waiting, WAITING until the chicken was no longer in that rubbery stage of limbo (technically edible, but far from that ideal chickeny, melt-in-your-mouth stage). It was ALMOST ready…but at 5:17 (and 1/2) p.m., when you’re waiting to serve (and to eat!) almost doesn’t count. When you gotta deal with homework, or bathtime, or cleaning up the cereal bowls that were left on the table since that morning, suppertime stress can bring you to the brink of madness. And possibly over the edge. Could the Instant Pot be the answer to our dinner-making woes? Super convenient and very safe (a completely different appliance than the old-fashioned stovetop pressure cooker), the Instant Pot is an electric pressure cooker that can take the place of seven kitchen appliances. We investigated and discovered Instant Pot users’ plentiful pros and handful of cons. 7 functions in just one appliance. The Instant Pot functions as a pressure cooker, slow cooker, rice cooker, steamer, sauté pan, yogurt maker, and warmer. Lightning-quick cooking. The crockpot chicken recipe I made had me waiting 6 hours for the chicken thighs to cook completely. With the Instant Pot, dinner would have been ready in a total time of under 30 minutes; the chicken itself only needs 15 minutes of cook time, but the pot needs 10-15 minutes to be brought to full pressure before it starts cooking. Not including pressure time, the Instant Pot can fully cook dried beans in 30 minutes (no soaking required!) and baked potatoes in 15. 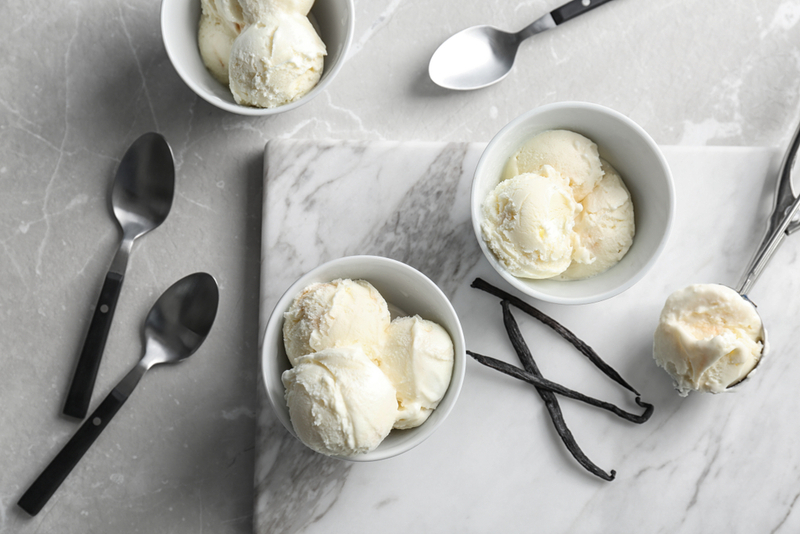 No defrosting needed. With only an added few minutes of cooking time, you can cook frozen meat and chicken directly in your Instant Pot. Improved tenderness. 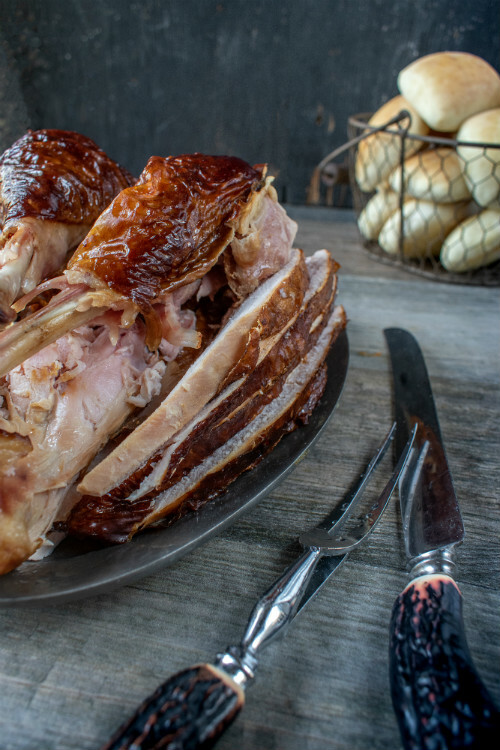 A pressure cooker quickly melts the connective tissues in meat, making roasts much more tender than standard oven or slow-cooking. Retains nutrients. Long cooking times over high heats can destroy nutrients. 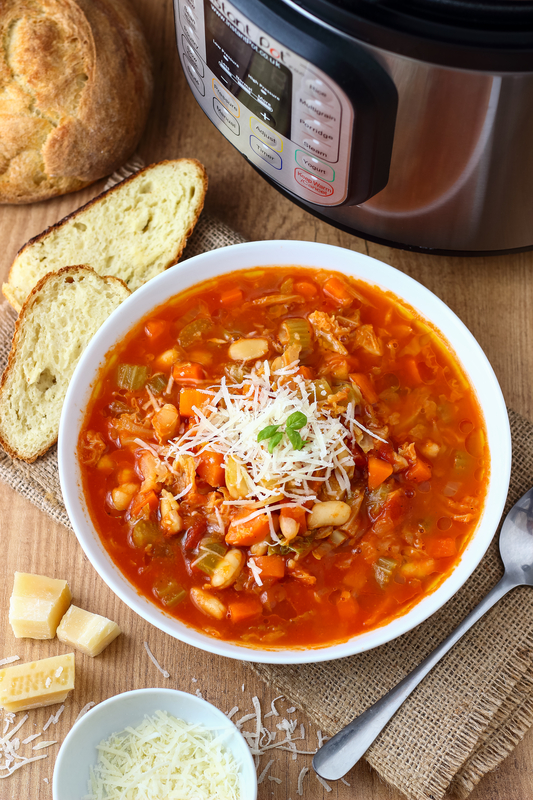 Pressure cooking speeds up cooking times, thereby retaining valuable nutrients. Foolproof. Instant Pot recipes and programmable cook times make it easy for virtually anyone to cook. It’s just set and forget. Eggshells slide off like magic. This may seem like a minor benefit, but if you cook hard-boiled eggs often, you can appreciate not having to peel off tiny bits of stubborn eggshells piece by piece. Steep learning curve. We’re so accustomed to cooking on a stovetop fire and in our ovens, but the Instant Pot is a completely different way to cook. You prep the food and the pot does the rest of the work (no midpoint stirring, sipping, or smelling the dish you’re preparing!) Many users say they mess up when they first use the Instant Pot. Special recipes. There’s no relying on prior cooking knowledge — because the Instant pot cooks in such a unique way, you’ll need to follow specialized Instant Pot instructions. Not crispy-crunchy. Despite its meat-browning “sauté” function, you can’t get a truly crusty finish or a fried texture with the Instant Pot. Not for every food. Pasta, fish, fresh vegetables, and other delicate foods can be tricky to cook in an Instant Pot. Since the high pressure cooks the pot’s contents super fast, it’s easy to overcook foods that need short cooking times. Overall, the Instant Pot can come to the rescue on days when dinner can’t be ready fast enough! 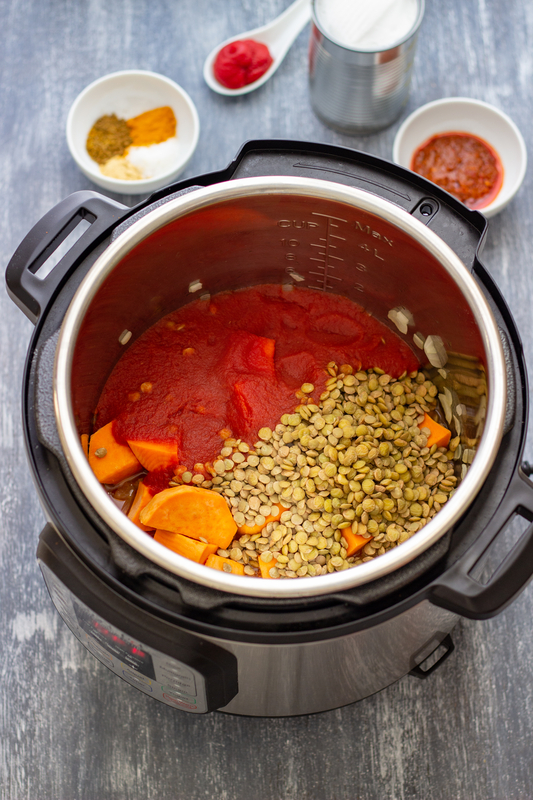 Have you tried the Instant Pot? Let us know in the comments if you think it lives up to the hype! It’s time to outdo those perfect instagramable pictures and concentrate on the actual flavor off-screen. Don’t get me wrong! I love a good fall-themed Instagram shot, but I love a mouthful of flavorful homemade heaven even MORE. Here are some ideas to help you veer away from the ‘traditional’ dish mindset and spice things up at your upcoming ‘friendsgiving’. Speaking of mashed potatoes, whoever knew that there would be so many ways to alter this staple “old-fashioned” dish? Whether you fry ‘em, half-bake them, blend in your Vita-mix for that velvety texture, potatoes are a true lifesaver. 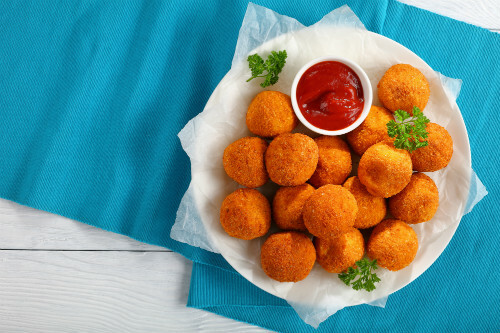 So this year, instead of the typical boring mash, try some fried mashed potato balls. We’re not trying to create more work for you, it’s as simple as combining your potatoes with herbs, garlic and the usual spices you like. Scoop into mini balls, dip in egg and then roll in panko crumbs and fry. If you’re looking for a slightly less indulgent form, pop them in the oven. I know I’ll be deep frying them until they get more golden than the piece of jewelry I’ve been eyeing all month. Now, let’s talk about pumpkin pie. It’s so convenient to use store-bought ingredients, but a homemade fresh, hot, healthy pie is really not difficult to make, we promise. Nowadays with 3-ingredient pie crust recipes, there is really no excuse. Rachel Kor’s crust in her Oats and Honey Granola Pie is perfect (water and salt don’t count! ), and if you want to add a health element to your pie crust you can try this one by From My Bowl. Not only do you get to choose which gluten-free flour you want to use, but you get the luxury of adding a health element to the crust alone: chia and flax seeds add the nutritional value that will ensure you’re not so guilty when you go in for a second slice. 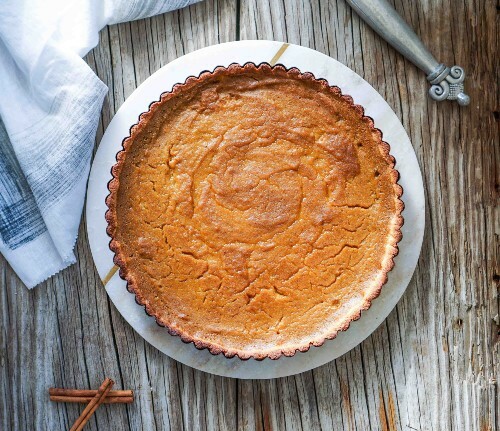 Rachel Goodman’s date-oat crust in her Flourless Pumpkin Pie is simplicity personified. )As for the filling, go on, just do it. Buy that fresh pumpkin (they sell already-cut pieces, LIFE CHANGER! ), cook it, mash it, spice it and use that as your filling. You’ll be forever thankful. Congrats! You finally did it. 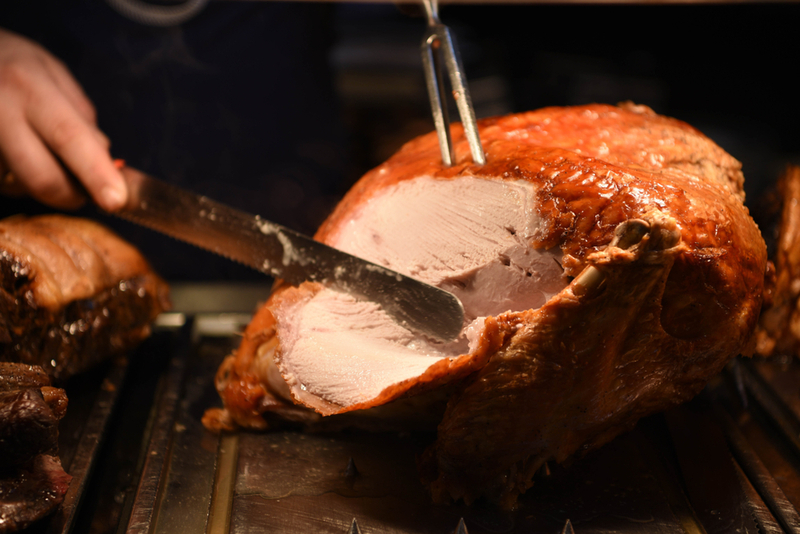 You roasted a gorgeous golden, scrumptious, succulent turkey. You spent hours finding and adjusting the perfect recipe. You’re fully convinced just from the smell, that this year your turkey is for sure the best-tasting turkey in the neighborhood.… and then all of a sudden you’re stuck. How do you get from gorgeously whole to perfectly carved? Although it might seem harder than carving a chicken, it’s really not. All you need is a Kosher turkey, sharp knife, clean kitchen counter (sorry if we’re asking for too much) and our detailed instructions. Oh, and bonus points for using a cutting board with a juice groove. Set up that carving station. Trust us when we say productivity skyrockets when it comes to having a clean kitchen counter with only needed utensils lying out. Mind you, those drying dishes on the counter will not stay clean once the juices of your turkey escape that cutting board. Remove the leg and thigh from one side. Position the turkey facing you. (Once you get used to a turkey lying in front of you, you’ll start seeing the art in it.) The leg and thigh should now be closest to you. Use that sharp knife you so readily prepared to slice through the skin between the breast and thigh so you can see the inside. Grab the thigh with no caution and push down until the thigh joint releases and pops out. 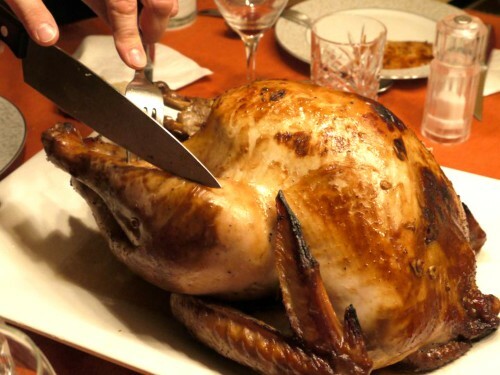 To finish it off, guide your knife carefully and cut the remaining thigh and leg off. Remove the breast. Still concentrating on the same side, it’s time for the breast to come off. 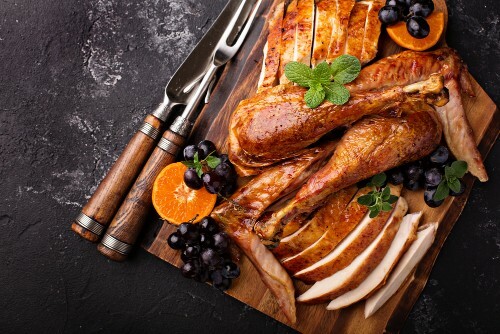 Carefully slice through that crispy skin on the top of the turkey along the breastbone directly from the neck joint. Continue through the breast meat, along with the rib bone, removing as much meat as possible. Remove the wing. Time for some wing action. Pull the wings back, and cut at the joint. It should release pretty quickly. Least work for the yummiest part – ironic, no? Repeat on the other side. You’re probably a pro by now at locating the right area of the turkey in a jiffy. Turn the turkey so the neck is now facing you. Remove the thigh and leg first, followed by the breast and wings. Slicing & Plating. The complicated parts are officially over!! Now for the presentation bit. The meat on the thighs should be easy to cut off from the bone. For decent pieces, slice the breast crosswise at a slight angle into quarter-inch-thick slices. And just like that not only does your turkey smell and taste like heaven, but it also looks like you actually know what you’re doing with a sharp knife. Cutting skills on point. Baltimore MD…The recent pushback by the Star-K Kosher Certification agency about the kosher status of Starbucks brought to the fore the complexity of certifying a large food chain with thousands of locations all over the world. According to Rabbi Zvi Holland, Director of Special Projects for the Star-K, there was an abundance of goodwill by both the company and kashrus officials to make Starbucks products available to the thousands of kosher consumers who enjoy the pricey beverage. Indeed, many of the products sold in Starbucks stores were kosher certified. But apparently the process of filtering out the good apples from the bad apples, kashrus-wise, became too complicated for both the company and kashrus agencies. The Star-K which has been working with Starbucks for several years to address kashrus concerns and even set up a pilot kosher program in 6 stores, announced recently on its website that it can no longer recommend many of Starbucks drinks to kosher consumers, due to the coffee company’s decision to end a joint program to help kosher adherents consume the Starbucks products. “Please be advised that Starbucks Corporation has decided to end the expanded Star-K kosher information program… the Star-K can no longer vouch for the kashrut [kosher status] of items previously listed that do not bear a reliable kosher symbol,” the agency said on their website. “This includes Frappuccino’s and all flavored drinks.” A listing of kosher products appears on the Star-K website. Rabbi Holland said that Rabbi Moshe Heinemann, the Rabbinical Supervisor of the Star-K, had come up with many creative solutions that would address the kashrus concerns. Many rabbis and agencies like the Orthodox Union were never enthusiastic about kosher consumers buying coffee and other products at Starbucks stores. Rabbi Moshe Elefant, the COO of the Kashrus Division of the Orthodox Union, explained that the stores sell many non-kosher products and that there is a great deal of comingling utensils and cookware in dishwashers. A petition on Change.org calling for Starbucks to reinstate the partnership with the Star-K is approaching nearly 10,000 signatures. Many consumers flatly predicted that while the Starbucks stores might be off limits for now, we have not yet heard the last word from both the company and ultimately from kashrus officials. Several rabbis reached by Kosher Today say that while Starbucks is by far the largest chain of its sort, others like 711’s which sell Slurpees or Dunkin Donuts are also examples of chains that have courted the kosher consumer. Kashrus agencies like the Chicago Rabbinical Council (cRc) provide kosher consumers with complete listings of Slurpees kosher products. Dunkin Donuts stores, say kashrus officials, may be less problematic since they use a chemical cleaning process rather than dishwashing. Yet, some rabbis warn that when Dunkin Donuts stands are part of a multi-brand set-up, all bets may be off especially if common dishwashing is practiced. 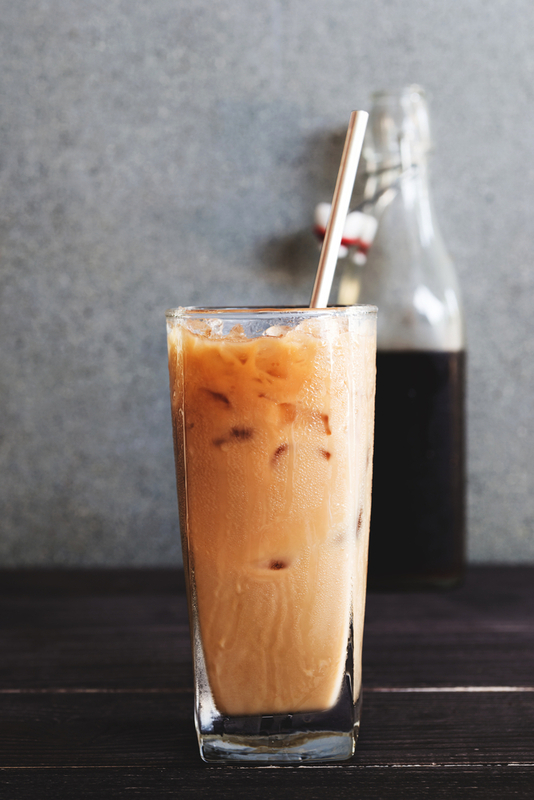 But there was some good news recently for kosher coffee users in that the LA based Coffee Bean & Tea Company is planning a comeback in New York and other locations, offering kosher consumers new options for kosher coffee houses. Black Friday is coming up and so is Cyber Monday. Some retailers count on robust sales on those days to offset slumping retail sales or to simply move merchandise. 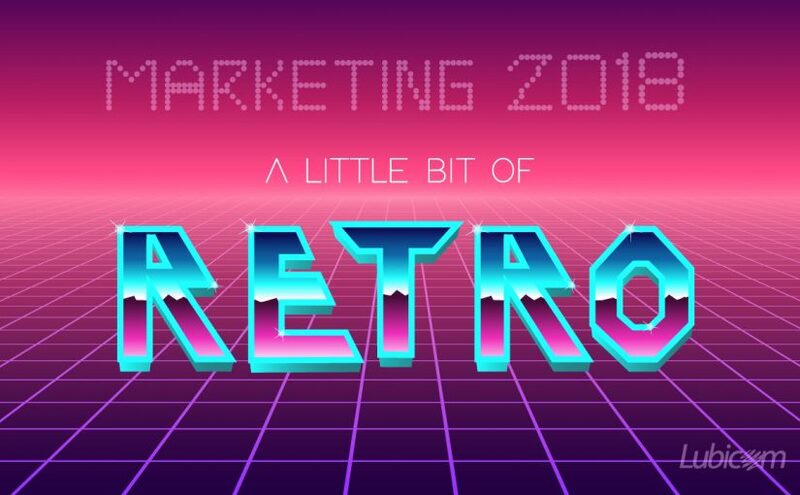 With today’s multiple marketing options, including digital marketing, it is not necessary to wait for those celebrated shopping days, but for the moment let’s focus on those two famous shopping days.. I have watched how retailers market those days and much of it is quite uninspiring. They seem to advertise specials, percentage off sales, two for one bargains, and even specials at each hour. I would like to suggest that retailers can potentially be more successful by coming up with a creative idea that is available only on that day. It has to be an idea that will motivate customers to go into the store or website. Many advertise ridiculously low specials and end up on the minus side because it turns out that the item becomes a loss rather than a loss leader. Customers tend to sniff these extraordinary deals and of course base their shopping on finding the basement bargain prices. 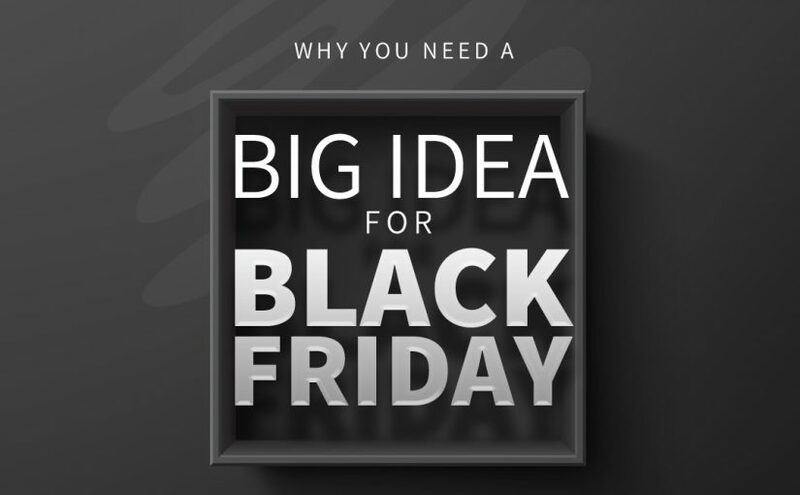 So what would be a big idea for Black Friday or Cyber Monday? Well, that’s the challenge but here’s one idea that I saw and liked. For every purchase that one bought for a certain price, they were given a sales certificate for a special on another day during the year. So where’s the genius here? Retaining the customer’s interest and getting the customer to come back at a future dates(s) when the store can usual use the increased business. But this is what I mean by out of the box and why it pays to consult with people who have the experience and wherewithal to move from the ordinary.